Behind Nottingham’s quiet country pub exterior lies the potential for a pulse-pounding adrenaline rush of a hen weekend. You just need to know where to look. Here’s a few ideas to help you and your girls have the action packed hen weekend in Nottingham you’ve been looking for. You can’t head to the home of Robin Hood and not have a go at archery. Archery is a brilliant hen party activity on its own but for those craving more of an adrenaline rush you might be interested in a game of Archery Battle Zone Tag. It’s a pulse-pounding mix of dodgeball and archery. Duck and cover on a large battlefield as you and your girls face off against the enemy using up-to-date modified bows. A day full of fun and thrills. 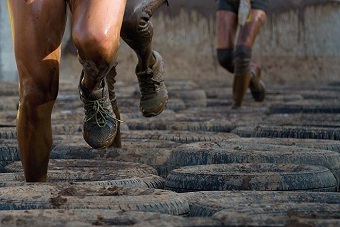 Prove that you’re a real soldier girl with the Nottingham Assault Course Hen Party! Head to the famous Sherwood forest for a fast-paced and competitive day out. Feel a real sense of accom­plishment as you overcome a testing obstacle course. Not only is it great fun but great exercise too. Take on the tire tunnel, scrap with the scramble net, hop over the high wall and take on many more obstacles with a hen party activity that’s sure to get your heart pounding! The Nottingham Blindfold 4x4 Driving Hen Party is a seriously thrilling hen party activity and the ultimate test of trust! One of you will be behind the wheel of an off-roader while the rest of the girls direct! You’ll need to work as a team and keep a cool head to overcome this challenging hen party activity! No matter whether you succeed or not you’re bound to have a great laugh and get the adrenaline pumping! Another one for the motorheads, the Off-Road Buggies Hen Party is perhaps the ultimate in pulse-pounding hen party activities and certainly not for the faint of heart! Get behind the wheel of powerful off-road buggies. These mud-splattering monsters with their roaring engines and crazy suspension are absolutely thrilling to drive. Race against your friends and navigate a mud-soaked track in this action-packed adventure of a day! See all our action packed activities and give us a ring on 0161 341 0052.